Researchers hope technique will provide cost-effective new method for drug screening. A research team at Stanford University School of Medicine reports on a new technique they claim allows scientists to rapidly generate three-dimensional cancers in culture using normal human epithelial cells from different tissues. The team claims their culturing method triggers a tumorigenic process that within just a few days mirrors the process of spontaneous human cancer formation that can take years in the body. Paul Khavari, M.D., and colleagues hope the technology will result in cost-effective new methods for testing cancer drug candidates in vitro, and provide new insights into how cancers develop. One of the observations they have already made is that the genetic changes occurring in the cancer-forming cultured cells were also the same as those occurring in spontaneous human cancers, but only if the transformed epithelial cells were cultured in a 3-D environment that included the basement membrane and stromal tissue underlying it. The Stanford research is published as an advanced online paper in Nature Medicine, titled, Invasive three-dimensional organotypic neoplasia from multiple normal human epithelia. Dr. Khavari is the School of Medicine’s Carl J. Herzog professor and chair of dermatology. The paper’s lead author is Todd Ridky, M.D., currently assistant professor at the University of Pennsylvania. 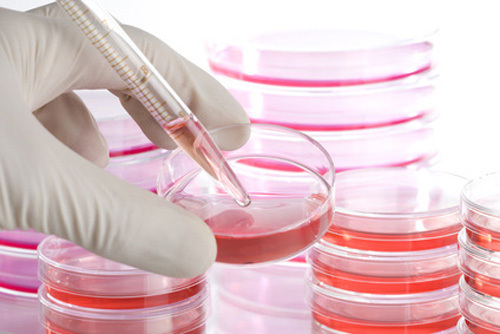 The study of cancers in vitro is currently hindered because cancer models based on tumor cell lines often lack key malignancy features and suffer from accumulated mutations that no longer reflect the native tumor and might confound functional studies, the researchers report. However, previous attempts to convert normal primary human cells into cultured cancers have been hindered by the need to apply different combinations of human and viral oncogenes dependent on the cell type. As a result, no one has managed to identify a minimal set of oncogenic changes that can transform multiple human primary cell types in parallel. Using primary human epithelial cells from skin, cervix, esophagus, and throat, Khavari and Ridky’s team transformed these tissue types into invasive neoplasias by introducing a physiologically relevant pair of genetic elements that encoded active human Ras and cyclin-dependent kinase-4 (Cdk4).